The Tony Awards Administration Committee met on April 28 for the fourth and final time this season to decide the eligibility of Broadway productions for the American Theatre Wing's 2017 Tony Awards, presented by The Broadway League and the American Theatre Wing. The Committee met regularly throughout the 2016-2017 Broadway season to make eligibility determinations. The Committee confirmed the eligibility of 16 Broadway productions for the 2017 Tony Awards. Other shows will be discussed at future meetings. The shows considered are Sweat, The Play That Goes Wrong, Amélie, Present Laughter, War Paint, Oslo, Groundhog Day, Indecent, The Little Foxes, Hello, Dolly!, Charlie and the Chocolate Factory, Anastasia, Six Degrees of Separation, Bandstand and A Doll's House, Part 2. Jon Jon Briones and Eva Noblezada will be considered eligible in the Best Performance by an Actor/Actress in a Leading Role in a Musical categories for their respective performances in Miss Saigon. Henry Shields will be considered eligible in the Best Performance by an Actor in a Leading Role in a Play category for his performance in The Play That Goes Wrong. Phillipa Soo will be considered eligible in the Best Performance by an Actress in a Leading Role in a Musical category for her performance in Amélie. Jefferson Mays and Jennifer Ehle will be considered eligible in the Best Performance by an Actor/Actress in a Leading Role in a Play categories for their respective performances in Oslo. Andy Karl will be considered eligible in the Best Performance by an Actor in a Leading Role in a Musical category for his performance in Groundhog Day. Peter Darling and Ellen Kane will be considered jointly eligible in the Best Choreography category for their work on Groundhog Day. Laura Linney will be considered eligible in the Best Performance by an Actress in a Leading Role in a Play category for her performance in The Little Foxes. 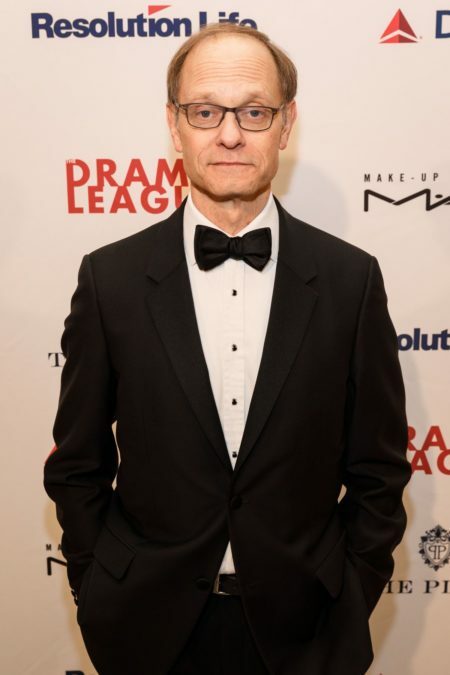 David Hyde Pierce will be considered eligible in the Best Performance by an Actor in a Leading Role in a Musical category for his performance in Hello, Dolly! Warren Carlyle is not eligible for the Best Choreography category for his contributions to Hello, Dolly! Larry Hochman will be considered eligible in the Best Orchestrations category for his work on Hello, Dolly! Christian Borle will be considered eligible in the Best Performance by an Actor in a Leading Role in a Musical category for his performance in Charlie and The Chocolate Factory. Christy Altomare will be considered eligible in the Best Performance by an Actress in a Leading Role in a Musical category for her performance in Anastasia. Lynn Ahrens and Stephen Flaherty will be considered eligible in the Best Original Score category for their work on Anastasia. Alexander Dodge and Aaron Rhyne will be considered jointly eligible in the Best Scenic Design in a Musical category for their work on Anastasia. John Benjamin Hickey will be considered eligible in the Best Performance by an Actor in a Featured Role in a Play category for his performance in Six Degrees of Separation. Corey Cott and Laura Osnes will be considered eligible in the Best Performance by an Actor/Actress in a Leading Role in a Musical categories for their respective performances in Bandstand. Jayne Houdyshell and Condola Rashad will be considered eligible in the Best Performance by an Actress in a Featured Role in a Play category for their respective performances in A Doll’s House, Part 2. All other eligibility rulings were consistent with opening-night billing.